The new Sandvik LH202 narrow-vein loader offers the best payload-to-own-weight ratio of its class for tunnel widths ranging between 2.0 and 2.5 metres – as well as many other benefits in usability and sustainability. The key challenge for economy in narrow-vein mining is dilution. Because of the often complex geometry of narrow-vein mineral deposits, with varying depths and shapes, mechanized extraction unavoidably results in some degree of dilution by waste rock. Because all the material must nevertheless be processed, this represents a significant cost factor that must be minimized to maximize the profitability of the operation. Sandvik LH202 raises the bar for narrow-vein loaders by delivering a three-tonne payload for tunnel widths of two metres and above. One of the most important ways to achieve this is to design the mine tunnels to be as narrow as possible, which obviously necessitates appropriate equipment capable of operating in such tunnels. Sandvik has responded to this challenge by developing a comprehensive range of compact loader and drill rig pairs, starting from a minimum tunnel width of 1.5 metres, going up to 3.0 metres. The loader payloads range between 1.0 and 6.7 tonnes. Sandvik LH202 raises the bar for narrow-vein loaders by delivering a three-tonne payload for tunnel widths of two metres and above. In addition, Sandvik LH202 is narrower than competing loaders with a comparable payload. This is an unprecedented capacity rating for this size class, essentially enabling more tonnes to be moved safely at less cost. The extremely compact size creates interesting possibilities for mine planners. The tunnel size can be decreased for lower dilution and reduced mine infrastructure costs. A reduction as small as 25 centimetres in the tunnel width can decrease mining costs by up to 5 percent. Beyond the compact size, the larger capacity is another way that Sandvik LH202 can reduce mining costs. The upgraded bucket design enables easier bucket filling and faster dumping. Combined with the three-tonne capacity, Sandvik LH202 has the potential for more tonnes per cycle and consequently fewer loading cycles and less fuel consumed. The maximized capacity combined with a very light machine, relative to its size, reduces the cost per tonne and offers superior productivity. Decreasing the need for engine power also improves productivity while cutting fuel consumption and reducing the load on mine ventilation. The fully reversible drivetrain eliminates gear shifting and enables simple, stepless operation compared with a standard driveline. This makes Sandvik LH202 a significantly easier loader to learn, even for an inexperienced operator. In addition to simplified operation, the hydrostatic transmission also helps to minimize maintenance and operating costs. The drive optimizes hydrostatic brake performance regardless of operating conditions, which minimizes brake wear and tear and reduces the oil temperature within the transmission system. The hydrostatic powertrain also helps to provide a high breakout force and fast acceleration, enabling effective handling of larger rocks with fewer interruptions, even in challenging conditions. Ergonomics is not only about operator friendliness – it is also a significant productivity factor. A good, highly ergonomic work environment can boost the productivity of an individual operator by up to 60 percent. Sandvik LH202 reduces the strain on the operator by providing more space and limiting heat sources near the driver’s seat, to support full focus on the task at hand. The instrument panel is located optimally in the operator’s field of view. Other ergonomic features include canopy lighting and fully adjustable seat and arm rests. Sandvik LH202 supports safer underground loading and hauling by placing the operator in a canopied ROPS/FOPS-certified compartment located in the loader’s rear frame, farther away from falling rocks during bucket loading. 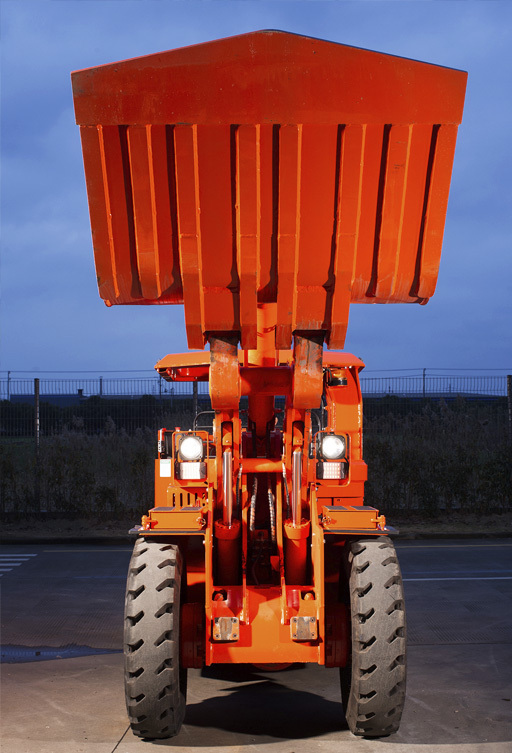 The standard canopy gives the loader a total height of 2,134 millimetres, which can be reduced to 2,017 millimetres by using the low-profile canopy option. Sandvik LH202 is designed for excellent maintainability: all daily servicing tasks can be performed on the ground level, reducing risk of slips, trips and falls. Other advanced safety features include door and neutral brake interlocks to prevent any sudden movements of the unit when stopped. Powerful LED lights are standard equipment to improve visibility and avoid collisions with the wall, other equipment and people. The new loader is equipped with a Tier 2 diesel engine as standard, but a lower-emission Tier 4 engine option is available for markets with more demanding engine emission regulations. The design of the hydrostatic transmission also inherently reduces maintenance needs because there is no brake cooling to be serviced and no gears vulnerable to abuse, and the load on the drivetrain is lower than in mechanical transmission systems.